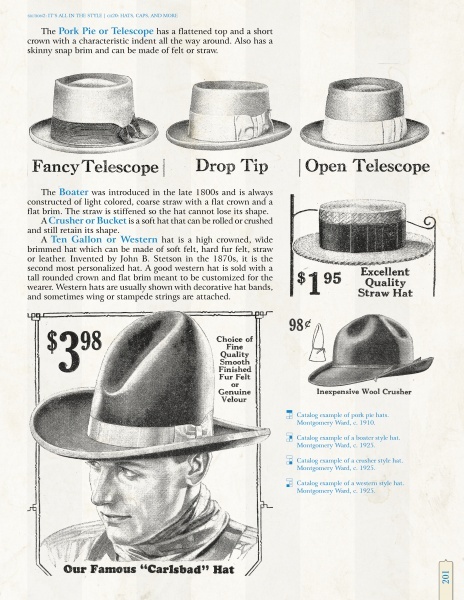 There are plenty of antiquing and womenswear reference materials that can also be useful for researching men’s vintage, alongside the indispensable resource of period men’s magazines and catalogs, of course. 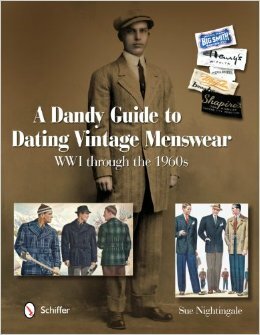 Yet relatively so few reference books explicitly address vintage menswear that I had to write about A Dandy Guide to Dating Vintage Menswear: WWI through the 1960s, by Sue Nightingale (2011). Divided into three sections, the book first covers dating based on labels, then styles, and finally miscellany like fabrics, innovations, and measurements. The full table of contents is reproduced below. I found the label dating information most useful and learned enough in the first few pages to easily justify the Amazon price of the book. 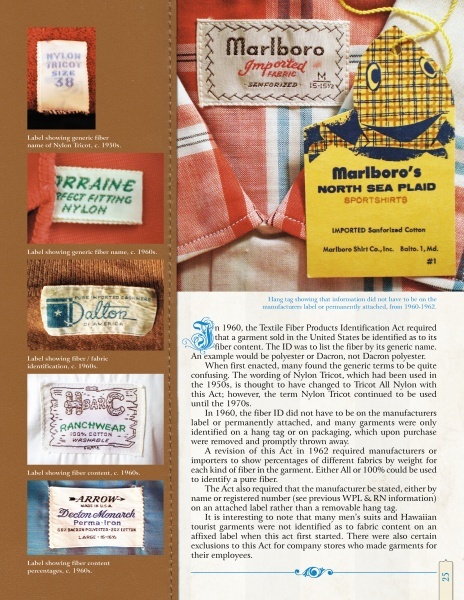 The label section provided very specific dating strategies for every kind of label from trademarks and RN/WPL numbers to fabric care and union tags. Something as small and simple as knowing that any garment with the common registered trademark symbol of the letter ‘R’ in a circle must originate after 1946 can come in incredibly handy in the field when you’re wondering whether a Woolrich hunting jacket is from the 30s or 50s. Obviously it isn’t possible to cover the label evolution for every menswear brand through the 1960s, but the book does touch on the big three nationwide department store and catalog businesses of Montgomery Ward, Sears, and J.C.Penney. The section on styles seems necessarily intended as an overview more than a concentrated guide to men’s styles in any particular decade. As such, it works well organized by type of garment, rather than by decade as one might expect. Since trends like collar and lapel widths seesaw a lot, there aren’t as many hard and fast rules to enjoy as in the label section, but the style section still serves to put any particular dating clue into some perspective. A Dandy Guide‘s great strength is providing plenty of authentic photographic evidence (in color wherever possible) of every label clue and trend cue that it discusses, as well as some helpful charts. One label that seems conspicuously absent from the entire volume is Brooks Brothers, and regardless of page constraints, it indeed seems odd that the book makes no mention of the longest running and most influential menswear brand in American history with all of its groundbreaking contributions. I still probably couldn’t be much happier with the book, which may be as much a testament to being in my early years of selling men’s vintage and a bit behind in my homework. Someone with decades in the business would surely find some material less of a revelation, but would be hard pressed not to learn something new from A Dandy Guide.